My good writer friend, Annie Logue, had an incredible experience this summer--she got to spend six weeks teaching in China. 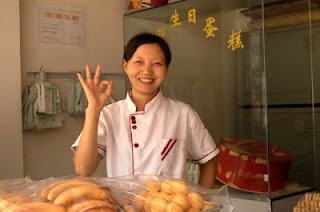 I love her financial blog posts, but she happened to have some thoughts about baked goods in China.. I dearly love all things flour, so I was worried about my stay in China this summer. I knew I’d have no trouble getting noodles, but I figured I’d have a summer without bread. But I was mistaken. It turns out that there are some mighty fine baked and fried treats available in the middle of the Middle Kingdom. 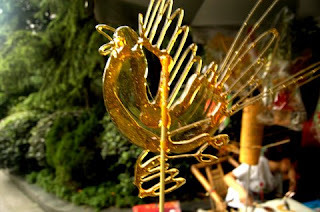 I was in Chengdu, the capital of Sichuan, which is known for its food. Apparently, the women are considered to be the most beautiful in China because the peppers makes them so hot. Po, the Kung Fu Panda (http://www.kungfupanda.com/), is from Qingcheng Mountain outside of Chengdu, and I was told that you can tell he’s a local because he likes to eat. In all the discussion of Sichuan favorites like mapo doufu (http://www.food.com/recipe/iron-chef-chinese-chef-chens-mapo-tofu-296880) and hot pot (http://www.chengduliving.com/a-fiery-feast-sichuan-hotpot/), the pastry gets overlooked. And that’s a shame. Another bake shop nearby had a large, changing assortment of cookies and cakes. My favorite were caramel rolls, which differed from the American version mainly in being a manageable size and having a light sprinkle of sesame seeds. Unfortunately, they were not available when I was taking pictures. I liked their sandwich cookies filled with a sweet bean paste, almond cookies, and pumpkin-seed cookies. 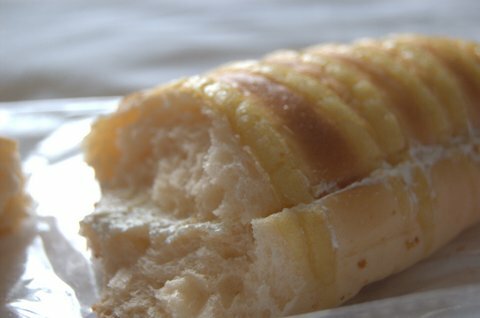 The bakery also sold rolls garnished with shredded pork, a common item in Chengdu. It seems that in China, cooks will put meat in anything they can find! The baker was really nice. That's not a surprise, because everyone in Chengdu was really nice and really friendly. 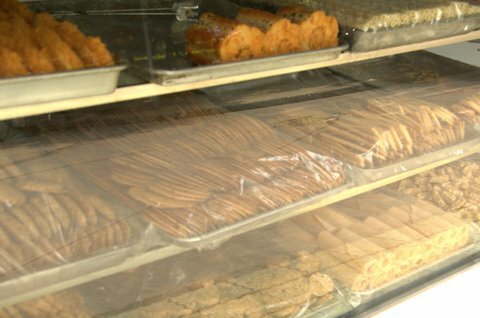 Many bakeries sold deep-fried twists , which had the sweet, plain taste of teething biscuits. That's a good thing; I'm the oldest of five children, so I ate a lot of teething biscuits growing up. 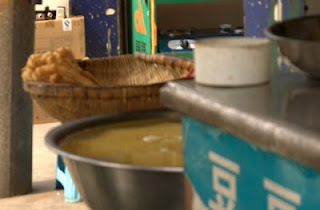 One of the standard breakfast foods in Chengdu is you tiao, which are fried breadsticks. They are a lot like unsweetened yeast doughnuts. They are usually served with warm soymilk or congee, a really thin rice porridge, which you can dip the sticks in if you like. 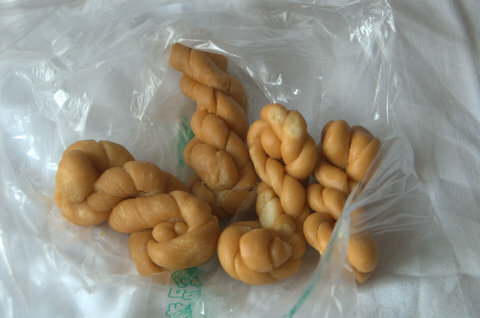 I loved you tiao, although I was sometimes tempted to sprinkle sugar on them. In addition to the baked goods, I really liked the caramelized-sugar suckers. Lucky winner! Caramelized sugar rooster sucker. These are sold in the parks. The vendors have spinners; for about $1.00, you take a turn at the wheel to select your shape. The best shape was the dragon. I won the rooster, which was pretty cool. The vendor spoons melted sugar on a marble slab, inserts a stick, and viola! A tasty treat. I'm told these vendors are mostly found in lesser-developed areas; Beijing and Shanghai are too sophisticated. Who knows if that's true? What I do know is that Chinese food was always surprising, sometimes in a bad way, mostly in a good way. The best surprises were the baked goods.